Why is Portugal lagging behind all other European countries in educational attainment? I don’t have the answer. I have just been playing with Barro and Lee’s dataset on education attainment. As the name indicates, it covers education attainment in 146 countries between 1950 and 2010 for different age groups. 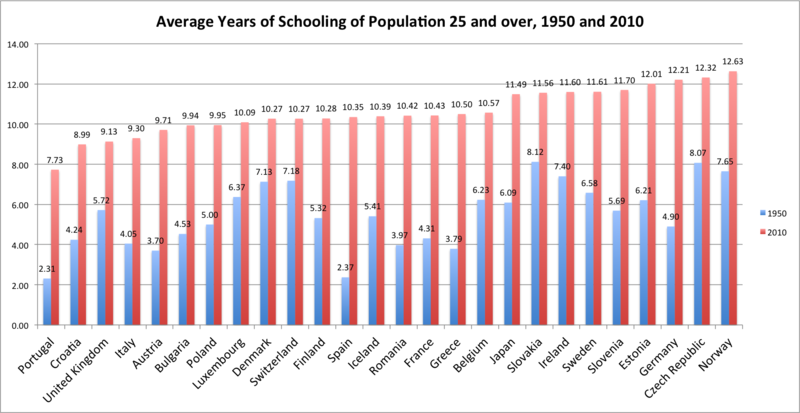 The two charts above show the average years of schooling of the population 25 and over since 1950 in 27 countries. I know that the first graph is difficult to read, but the point is to show Portugal’s outlier status in comparison with all other European countries. With 7.73 years of schooling on average, the Portuguese workforce was the least qualified in the EU in 2010; the average for the countries showed in the graph is 10.62. 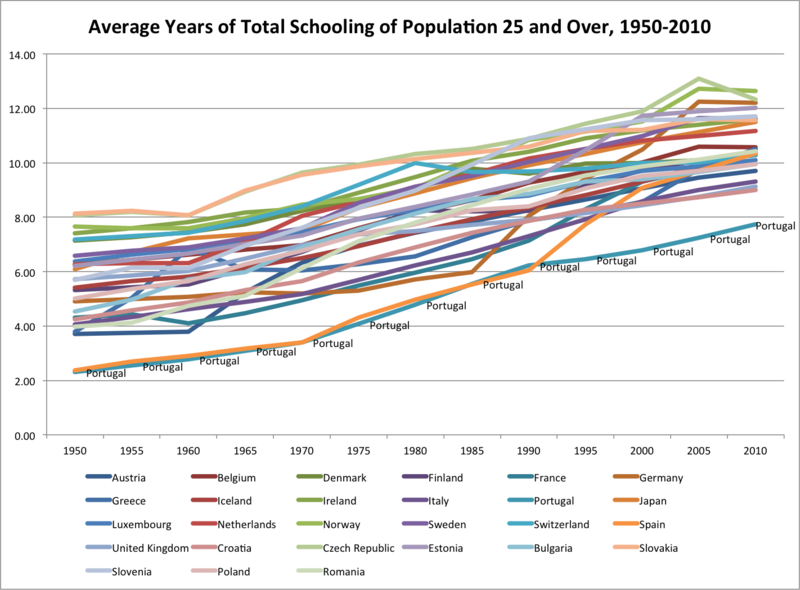 Portugal started below everybody else in 1950 (compulsory schooling under Salazar was 4 years, and many were simply not enrolled) but I cannot really understand why it is still lagging behind Spain, which started from a similar position, namely a long fascist dictatorship keen on maintaining a docile and uneducated populace. 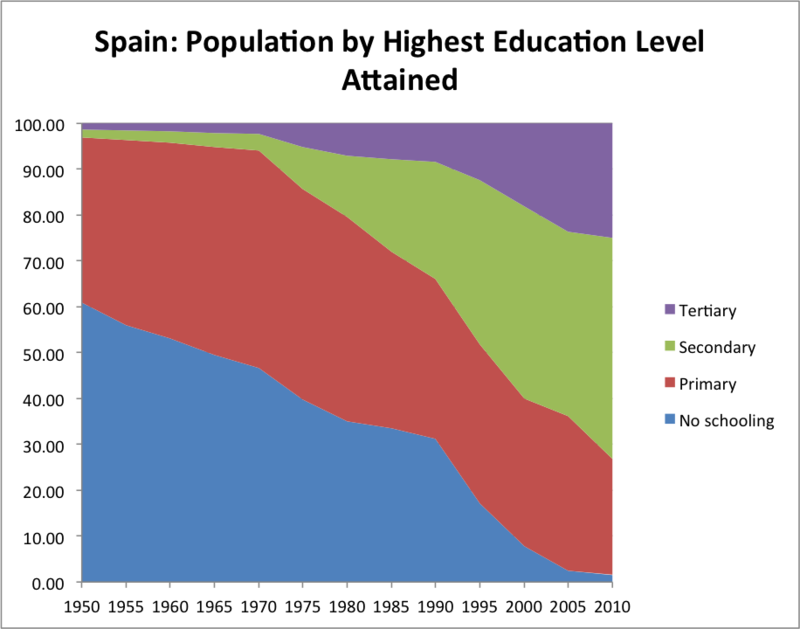 The three graphs below show the population (25 and over) between 1950 and 2010 in Portugal, Spain, and Sweden (as a point of comparison for “advanced” countries) by highest degree attained (but not necessarily completed). 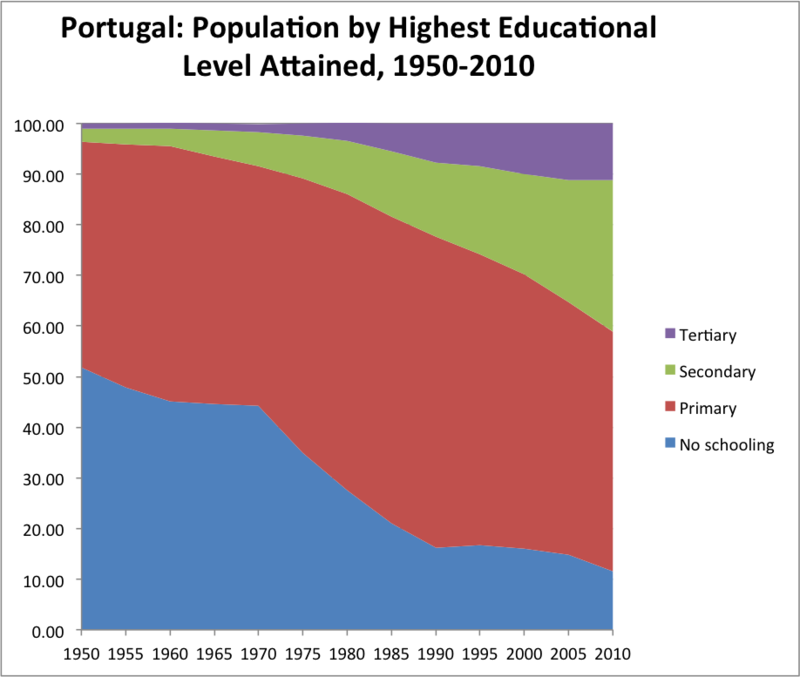 Even if a higher proportion of the Spanish population had no schooling at all in 1950, this share has been reduced dramatically while it has remained at high levels in Portugal. According to the data, 11.5% of the Portuguese population had no schooling at all in 2010, and 46% had gone through primary schooling only. 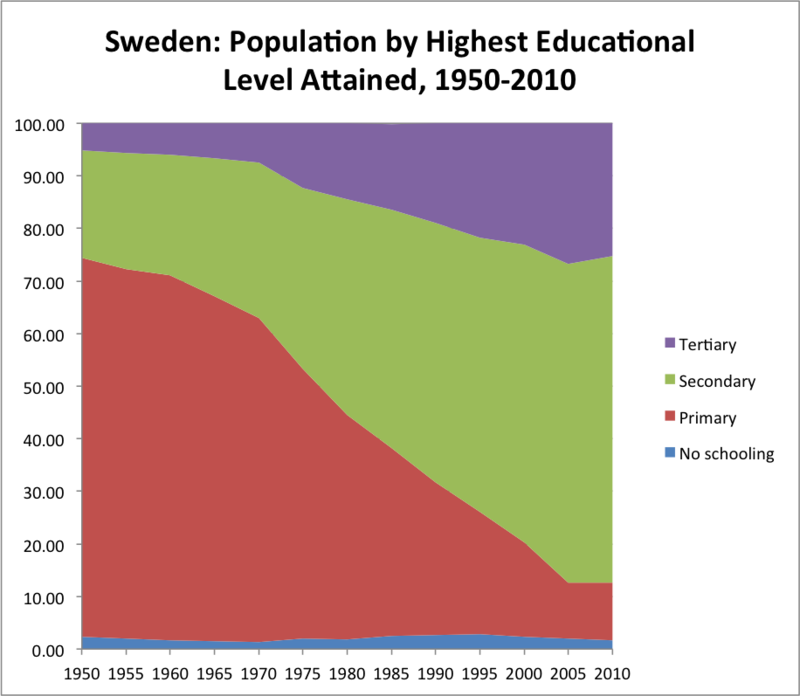 The corresponding numbers are 1.6 and 25% in Spain, and 1.6 and 11% in Sweden. This happens in spite of the fact that Portugal has a fairly low student-teacher ratio and has invested massively in education over the past few decades. However, as the number of PhDs has exploded, the problem of low skills at the bottom is still huge. As we know, low productivity is a big problem in Southern Europe, and this is probably strongly related to low education levels. Cuts in spending certainly won’t help to solve this problem. This entry was posted in Welfare and tagged Barro, Compulsory Schooling, Education, Gap, Portugal, Spain, Sweden on July 13, 2013 by alexandre afonso.